Buried from view inside the the piano, is a complex construction of wooden parts, working precisely with each other to propel a slice of wood-wrapped felt upwards to the piano string, when set in motion by the downward pressure of the pianist’s finger. It is the violin bow of the piano. Like a violinist uses a bow to activate the strings, the pianist uses the piano keyboard and action mechanism to produce music. In fact, it can be easily removed from the instrument and repaired, adjusted, and rebuilt as a separate component of the piano. A mechanism born in the mind of a promising young Italian instrument maker during the early 1700’s, the piano action exists today essentially the same as Bartolomeo Cristofori invented it-- a handful of small wooden levers for each key, hooked together with small metal pins. 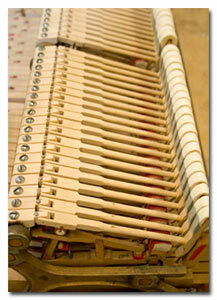 The piano “action” is a catapult, of sorts, for the piano hammer. It takes the speed and force of the pianist’s hands and multiplies it by approximately five times. It then catches the hammer on the rebound from the string and reloads the mechanism before the key returns back to its rest position. When action parts are sufficiently worn down from playing, they reach a point when a good regulation becomes very difficult to achieve. Replacing these parts with new parts and regulating the new parts to work properly is generally called rebuilding. Action regulation, or rebuilding work with regulation work, allows the piano to be played more sensitively with greater evenness, control, and power. It opens the door to more musical playing and to a new level of pianistic ability. 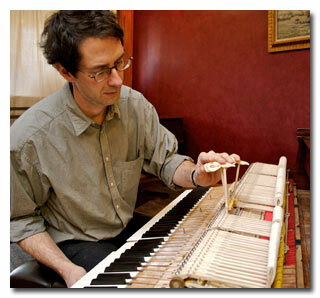 No part of the piano technicians work is more customized than the action. I take the time to learn both the needs of the pianist, and the specifics of each instruments. From that basis, I craft an action that takes full advantage of the instrument and its player.